Stencils, Stencil patterns, wall pattern stencil kits. Stencils for DIY decor. Check out these clever Wall Pattern Stencil Kits! Easily create your own wallpaper pattern with these simple stencil designs by random placement. Allover stenciling just got really easy and fun without the need to perfectly align the stencil! Our innovative Wall Patterns Stencil Kits are designed in such a way that they can be placed by eye with no measuring necessary. 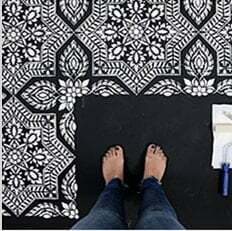 You will be amazed at how quickly you'll be able to cover your walls with these gorgeous stencil patterns and how little paint you'll use. These wall pattern stencils are a very cost effective alternative to pricey designer wallpaper and you can say you painted it yourself! Fun, Fast, Easy and Inexpensive! Just perfect for DIY decor.Please watch our How To Stencil Videos to learn this simple stenciling technique.